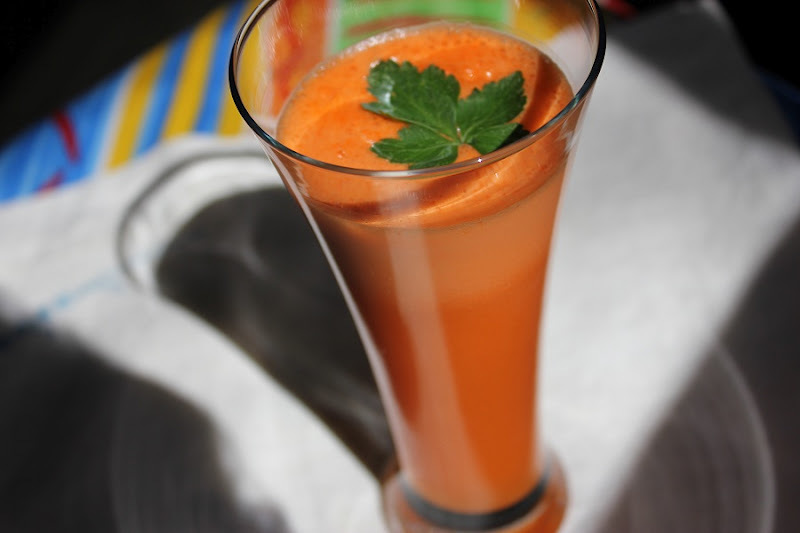 Carrot-apple-ginger juice - for energy! This post was written a few months ago when my parents still were here. Things have changed since, and you can see how from the crossed text. Remember Happy March 8th! post? It's not just a holiday, for us it is a big holiday, like another Christmas, which means some gifts. I got a few. Do you want to see some? For many years a word "pasta" gave me a shivering. Nothing "pasta" would raise my appetite, on contrary I would rather eat just a plain bread than pasta. Needless to say, I rarely cooked pasta at home, just when kids were asking bagging, not that often though. Why is that? Many reasons, I would say, main being that pasta doesn't taste good. Didn't taste good to me until I discovered a home made pasta. Apparently, my taste buds were in dormant stage for the store bought pasta. And then mom came to the rescue. And then to everybody's happiness pasta found a place in this home. 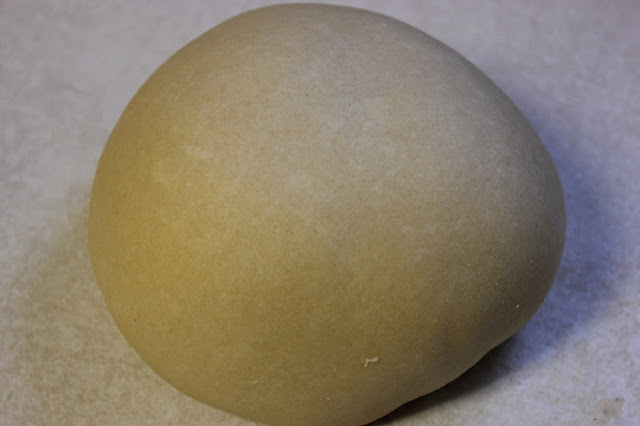 Pasta dough is easy to make even for a teenager. Flour-eggs-pinch of salt-water-oil-mix-rest-roll-cut-cook-enjoy! See how easy, right? Mother said that this recipe she has learned from her mother, and it was always done by hands, but I use my food processor or a stand mixer (lazy me!). 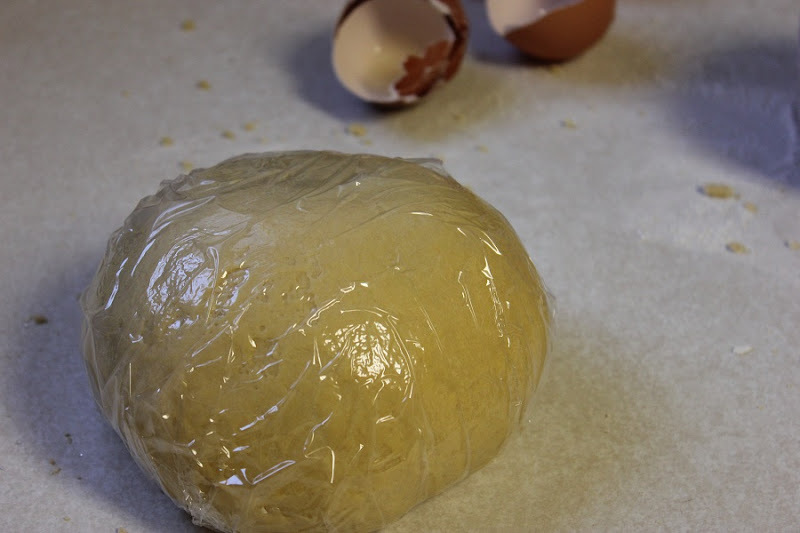 Form a ball and cover it with plastic wrap for a minimum 30 minutes. Then knead it again and ... here I wish I had a pasta dough roller... I let the Kitchen Aid pasta roller attachment to roll the dough until it has required paper thin desired thickness. Cut the dough and toss it with a little corn or regular flour (to prevent it from sticking). Boil a large amount of water, add salt and 2-3 Tbsp olive oil, add pasta, and cook 2-3 minutes (this is the time for the fresh pasta. 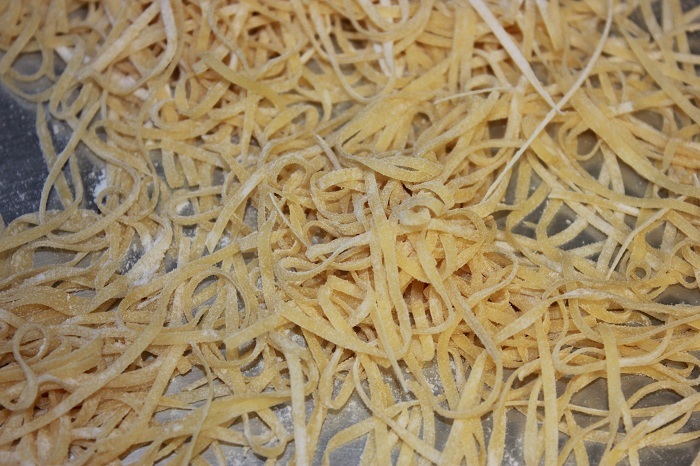 Dry pasta needs to be cooked longer, about 5-7 minutes). I set the kitchen alarm for 2 minutes and taste it. Some like it "well done", we like it al dente (firm to the bite). Then pasta is dressed with vegetables, sauses, or just olive oil and garlic and served hot. That is pasta I love, we all do. 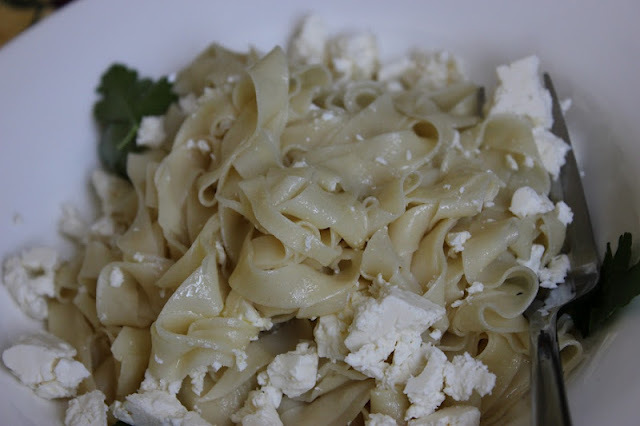 Pasta with Feta cheese and olive oil: I ate it all! I just put in the blender a handful of parsley, a handful of walnuts, 2 cloves garlic, and a small piece of Pecorino Romano cheese (my favorite!). I gave it a couple of pulses and added freshly squeezed lemon juice (from 1,5 lemons) and a tablespoon of a very good olive oil. Pulsed again, and pesto was done. 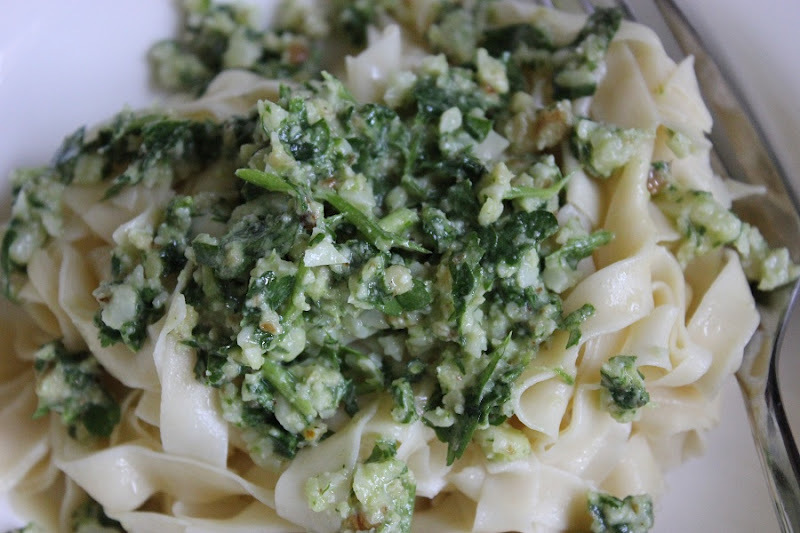 I saw your comment on Mark's blog and suggested you make parsley pesto with your excess parsley. It seems you already have - good isn't it? Thank you Liz! Yes, It came our very good, I am not sure which one I like better now: basil or parsley! Thanks Marie! It is not that hard, I use to make it by hands before I got the roller attachment. I still do most of the work by hands. Good luck! Looks amazing! I have never made pasta before. Usually I make my husband try something new first. I will see if he is up to making pasta. This tastes so good that he sure would like to try it. I don't know what they do with a store bought pasta, but it tastes different. 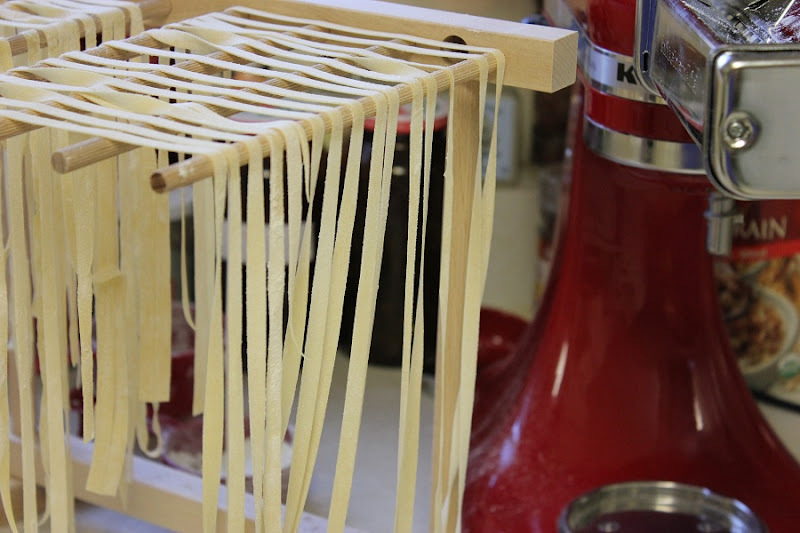 I love homemade pasta but have been too lazy to make it, even with my pasta attachment. I think you have motivated me, thanks!!! I love homemade pasta. I have visitors coming for dinner friday - maybe I'll make it. Thanks for the reminder. What a lovely post. 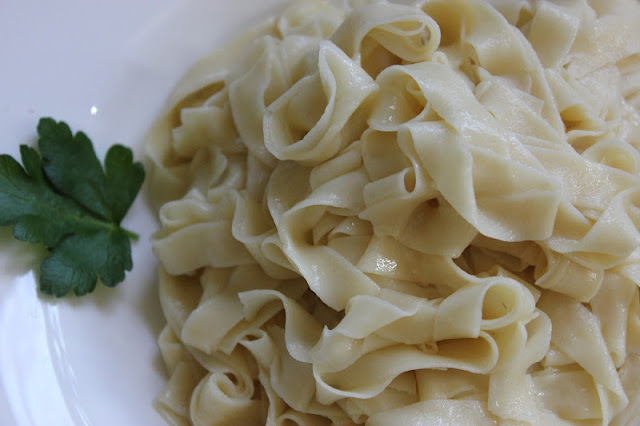 Homemade pasta is delicious, yours looks amazing. Well done! Oh yes, homemade pasta is sooooo much tastier and better than store bought. Yours look great. And the question I have: what do they do with that store pasta that it tastes so different?! So jealous!! 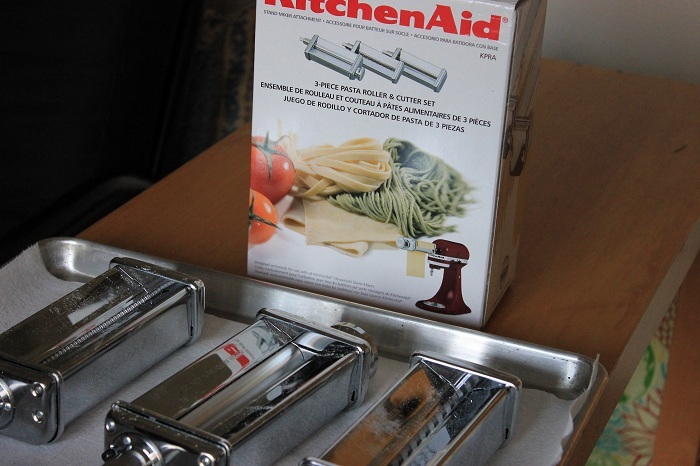 I need that pasta attachment for my kitchen aid! And I am going to make some carrot apple ginger juice when I get home - I have made carrot/apple which I love, but never added ginger to it! I think the only way I could have pasta in my life is if I get a pasta maker so I can make my own! And guess who's birthday is coming up in 12 days? Yep! :)BTW I love feta -- one of my favorite cheeses! 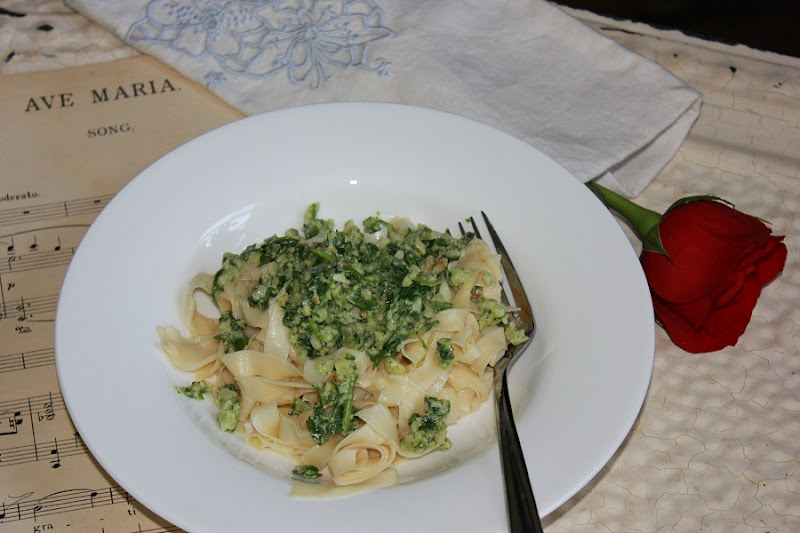 This looks wonderful, homemade pasta and parsley pesto, nothing could be better. Lovely photos. Oh my YUM!! Looks wonderful. I have always wanted to make my own pasta, but just never have tried. Maybe soon. You make it look so easy!! That pesto looks devine though, I definitely will be doing that. The carrot apple juice looks wonderful too. Thank you Ginger. I visited your blog today and guess what? I got the book! Marina, that looks beautiful. I haven't made homemade pasta in years; must put it on my to-do list. I enjoyed reading your About page and hope the couple you inspired to try a few vegetables have stayed with it. Thank you Jean. I hope so too, and I hope they are doing well. I enjoyed pasta making. You made the task of making homemade Pasta look like child's play!Never thought it would be this easy:) I'm Sudha BTW and so lovely meeting you. I know you joined me quite some time back couldn't reply back any sooner due to a terrible laptop fiasco!Anyway, I've joined in with you now and it has been such an experience trawling through your blog.Also, I read your 'About Me' section and realized how strong a person you are!Your friend was absolutely right about that - and I'm sure you must have emerged a much stronger person. I did face a similar type of upheaval in my life at one point and I know just how frustrating that can be. But then, just like you, my blog had come to my rescue and it has stayed on with me since. All I can say is do not harbor any regrets for any choices that you've made - destiny might have meant you to opt for that!So stay happy, keep happy and keep blogging:)Cheers! Thank you Sudha for visiting and leaving such a kind comment. Homemade pasta is quite a tough project Marina! You did an excellent job and your family recipe is very much appreciated! Thank you Katerina. I looked at it from the different prospective: kneading the dough can be therapeutic... It calms down, really. I was a bit edgy yesterday but when I was done with the pasta, I was all calm and peaceful. I enjoyed it.